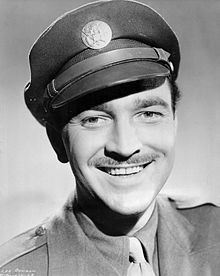 Lee Bowman (December 28, 1914 – December 25, 1979) was an American film and television actor. According to one obituary, "his roles ranged from romantic lead to worldly, wisecracking lout in his most famous years". Born in Cincinnati, Ohio, Bowman dropped out of the University of Cincinnati Law School to study at the American Academy of Dramatic Arts. He was spotted by a Paramount Pictures agent and went to Hollywood in 1934, but was not used at first. Instead he worked as a radio singer and appeared in stock plays including The Old Lady Shows His Medals. Bowman eventually made his film debut in I Met Him in Paris (1937) for Paramount. He worked at that studio for a while, then RKO before moving to MGM. The lack of leading men in World War II was a boost to Bowman's career and he co-starred with Rita Hayworth in Cover Girl and Jean Arthur in The Impatient Years. According to a film writer at the time, "his Hollywood career has not been spectacular but has gained him a large following." He was signed by Columbia Pictures. The Impatient Years was a hit and Bowman was described in late 1944 as "now a very hot commodity in Hollywood." However, he never quite progressed beyond supporting female stars and his status as a leading man faded. After making his TV debut in The Silver Theatre in 1950, he appeared regularly on television including several guest appearances in the television series Robert Montgomery Presents and Playhouse 90. In 1961, he co-starred with Rocky Graziano in the private-eye series Miami Undercover, the first television series made in its entirety before being sold to a network. In his later career, Bowman was a pioneer in developing media training for the Republican leadership in Washington. In 1969 he was hired by the Nixon administration to help freshman representatives and politicians from marginal districts with their delivery, content and staging. (The job was described as being similar to Robert Montgomery's work with Dwight Eisenhower.) He also served as Master of Ceremonies for the 1968 and 1972 conventions. From 1974 until his death, he was Chairman of the Kingstree Group, an international consulting firm, which offers communication advice to business and political leaders all over the world. Kingstree's global headquarters is now located in London, England. Bowman was responsible for developing the 'conversational' approach to spoken communication, which is recognized today as the only successful model for business and political presentations and media interviews. For fifteen years Bowman was communications consultant for Bethlehem Steel. Bowman was married to Helene Rosson, Victor Fleming's step daughter. Their son, also called Lee Bowman, continued with the Kingstree Group. Bowman also had a step daughter from an early marriage by Rosson. 1952 Suspense "I Won't Take a Minute"
^ a b c Lee Bowman, Actor; Was a Star in Movies And TV Ellery Queen: Did Serious Roles on Broadway New York Times (1923-Current file) [New York, N.Y] 28 Dec 1979: A20. ^ a b New Film for Jean Arthur Like 'More the Merrier' By Frank Daugherty Special to The Christian Science Monitor. The Christian Science Monitor (1908-Current file) [Boston, Mass] 21 Apr 1944: 5. ^ A NICE GUY: This Co. B corporal may be eating K rations by now. But oh, the memory of that lunch with Lee Bowman in Hollywood SHER, CORPORAL JACK. Los Angeles Times (1923-Current File) [Los Angeles, Calif] 31 Dec 1944: E10. ^ Aaker, Everett (2006). Encyclopedia of Early Television Crime Fighters. McFarland & Company, Inc. ISBN 978-0-7864-6409-8. P. 61. ^ a b Actor Lee Bowman Dies; Suave Star of Films, TV Los Angeles Times (1923-Current File) [Los Angeles, Calif] 31 Dec 1979: 10. ^ Lee Bowman, Actor, to Coach G.O.P. Speakers on TV Style New York Times (1923-Current file) [New York, N.Y] 22 July 1969: 13. ^ a b It's the way you tell 'em, says speech guru: [1GB Edition] Oldfield, Claire. Sunday Times [London (UK)] 18 June 2000: 14. This page is based on the Wikipedia article Lee Bowman; it is used under the Creative Commons Attribution-ShareAlike 3.0 Unported License (CC-BY-SA). You may redistribute it, verbatim or modified, providing that you comply with the terms of the CC-BY-SA.